I made this card last summer and forgot to post it. I don't recall if it was inspired by any other card I saw.... However, I do know for sure that I learned to do the cool background from somewhere else (I think a PTI designer) where you pat your impression plate with white pigment ink and then run it through your machine to emboss it. Looks very cool! I like that it gives a little extra something to the background. 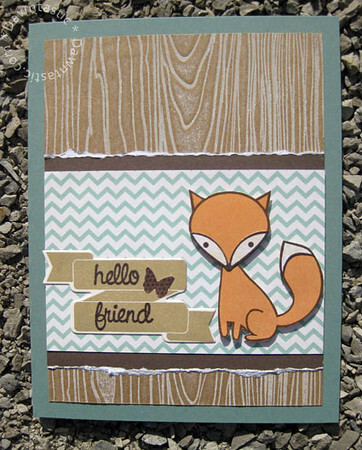 The fox stamp is paper pieced from the Hello, Foxy mini stamp set from Papertrey Ink (PTI). For the torn paper edges, I used one of those deckle edge rulers you tear against to make that effect. It was the first time I had used this tool and it turned out pretty good. 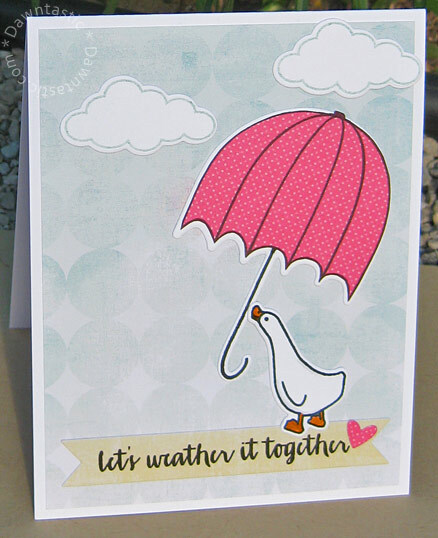 UPDATE: I think it was this burlap-fronted fox card by Jessica Witty that inspired my card. 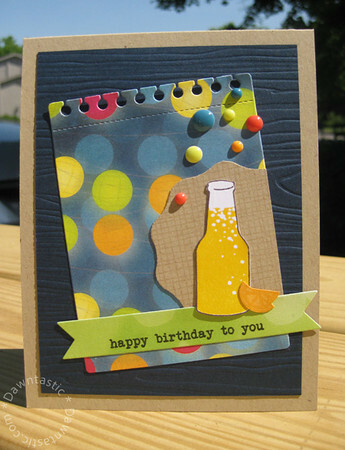 Stamps: Soda/Beer: Avery Elle The Man; Oranges: WPLUS9 Milk & Cookies; Sentiment: From a Studio Calico kit set; Crosshatch from Market Street Stamps (closed). Pattern Paper: Lemonade Stand Collection by BoBunny. Ink: Clouds: PTI Ocean Tides stamped off once.